For a city to function properly and run smoothly, its people must be healthy and fit. Emergency dentists are one of the things that make it better for the people. Emergency dentists and dental clinics are always open, so they can be reached at any time and due to any kind of emergencies. You might be coming down with a sudden attack of toothache, or might have hurt your teeth to the point where they are bleeding constantly. Whatever the case is, emergency dentists will be able to help. They are qualified to solve even the most complex of issues regarding teeth, and they take the greatest care to make you feel comfortable in their care. These dentists are usually certified and they come with years of experience behind them. But as a precaution, when you visit these dentists, make sure that you know their credentials and reliability. In most cases, you will find genuine dentists who are talented and skilled in their profession. The emergency dental clinics are adequately equipped to give you the best treatment and return your beautiful smile back to you. Being the largest city of the Snohomish County in Washington, Everett has a population of over 103,019 according to the 2010 census which has undoubtedly gone up by now. The city was then recorded as the 7th largest city in the state of Washington. The city received the All American City Award in 2010, but besides this the city is also home to the largest public marina that is located on the west coast of the USA. The city is also home to the largest assembly plant of Boeing. By acknowledgement of all of these different advancements, it is quite clear that the city is self-sufficient in providing its citizens all kinds of the modern day facilities. One of these facilities is emergency dental clinics that remain open 24×7 in the city. Description: If you’re experiencing a toothache, chipped tooth or another dental emergency in the Everett, Marysville, Edmonds, Lynnwood, or Lake Stevens area, Emergency Dental has experienced emergency dentists available for urgent care. Our clinic accepts most dental insurance (indemnity basis), offers convenient appointments for non-emergency patients, and has payment and financing options to suit most budgets. 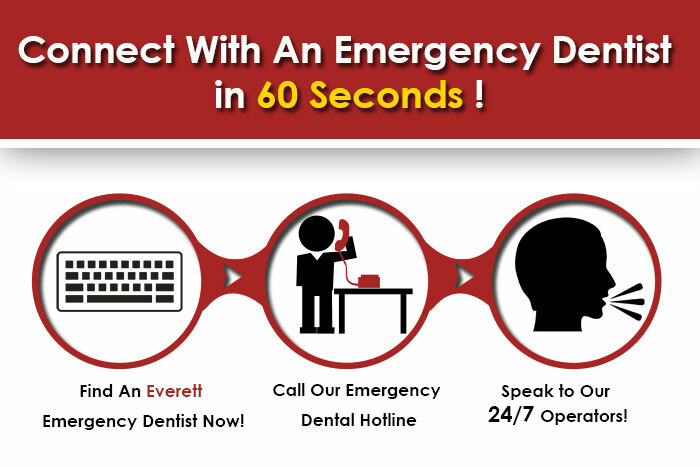 Emergency Dental Care USA of Everett is committed to getting you the dental care you need at a price you can afford. The clinic is open every day except Wednesday, and same-day treatment is usually possible. They offer a great many dental services, some worth mentioning are- Waterlase dentistry, general dentistry, laser dentistry, jaw pain and jaw pain induced headaches, teeth whitening, cosmetic dentistry, bridges, crowns, veneers, gum disease, dental implants, pediatric dentistry, and a few more. You can find them at any time in 4608 Dogwood Drive, Suite A, Everett, WA 98203. You can also call them at 425-258-2633 to set an appointment. Brush Dental can handle everyday simple problems that you might be facing. They can provide instant relief for cases such as toothaches, headache due to toothache, crowns and veneers, root canal surgery, etc. Call them at (425) 357-0911 or visit their clinic in 10305 19th Ave SE, Everett, WA 98208. Popular for being the most technologically resourceful, the Gentle Dental clinic has been around for a long time. Their doctors are experienced and learned in the occupation of dental care and you can trust them to your heart’s full potential. To get in touch with them, call 425-242-5685 or visit them on 305 SE Everett Mall Way, Suite 18, Everett, WA 98208.